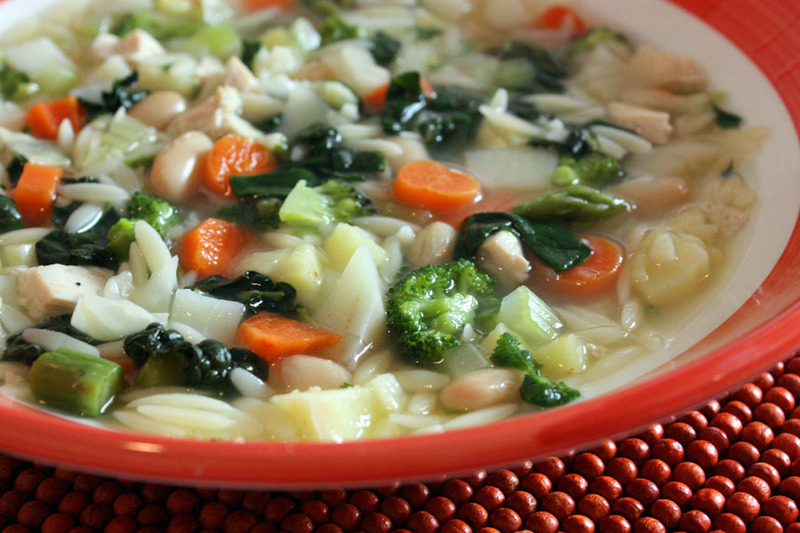 Vegetable-bean soup makes a healthy meal all by itself. This is the reason I always have a bunch of vegetables in the fridge and my own frozen chicken stock in the freezer. It was “Soup for Dinner” night tonight. So I thawed some of my homemade stock and added… carrots, potatoes, parsnip, celery, cabbage, broccoli, kale, spinach, asparagus, cannelini beans, some leftover diced chicken, orzo, and parsley. It’s basically a delicious vegetable soup but the added chicken and beans provide protein and fiber for a complete meal and a filling one. I was going to have one bowl but it was so good I had two! There were more vitamins in this healthy meal than any vitamin pill. 3 Comments on "Soup for Dinner"
Wow!! That looks too good to be true! We love soup. This is a must try.